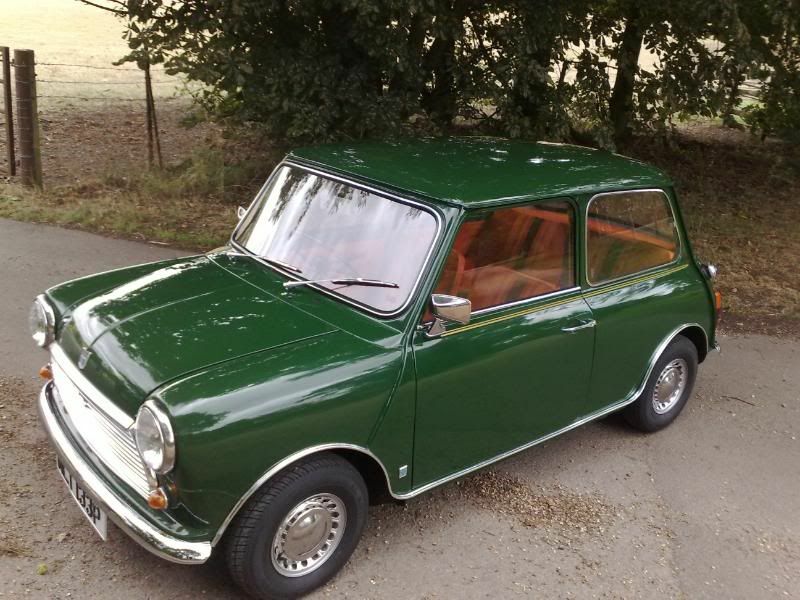 "The Mini 1000 Special (also referred to as the Mini 1000 Limited Edition or Stripey LE) was the first Limited Edition Mini sold and marketed in the UK. In the 1970's Limited Edition versions of any car model were unheard of in the UK and therefore led the way for things to come. The Mini 1000 Special was also the first round-nosed Mini with eye-ball air vents, twin chrome door mirrors and reclining front seats. The Brooklands Green exterior colour was an MGB colour and differs from the Brooklands Green used on the 1999 John Cooper LE. Many Mini 1000 Specials painted in this colour retained a glacier white interior suggesting the bodyshell's exterior had been over-sprayed. A very rare edition indeed as very few Mini 1000 Specials exist. This is mainly due to many of its unique features being adopted into standard production models over the following years leaving it difficult to tell a 1000 Special from any other '70s Mini." The rarest mini of all is a rust free one. Leaving out limited edition minis I think the Rover Cabriolet must be one of the lowest numbered models produced at just over 300 ? The Basic MK1 cloth seat car must be rare. The Lamm cabrio was much rarer than the Rover version. Only 75 made. Had one but sold it. The ERA Turbo was also rare with only 87 UK production cars made, though lots have been imported from Japan now. Had No4, which was the press demo car. Unfortunatly sold this one as well. That lamm was a limited edition run built for Rover. Not really a production car, and lamm made more of them. The ERA was there not over a 1000 produced ? Just checked, Wikipedia says 436 ERA's produced. Most ERA's went to Japan. 99 UK spec cars built, of which 15 were exported to Germany and Japan and one to the Sultan Of Brunei. The 970 mk1 Cooper S would be very rare. Rumours have them at about 50 surviving. Simon would have a better idea!